After a long and treacherous grind I finally opened my 1st 6* crystal. 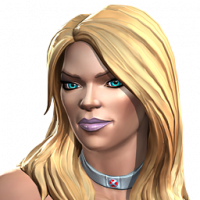 I will admit the champ I got was probably lowest on my list, as I wanted to land a God Tier attacker like CG, CapIW, Domino. 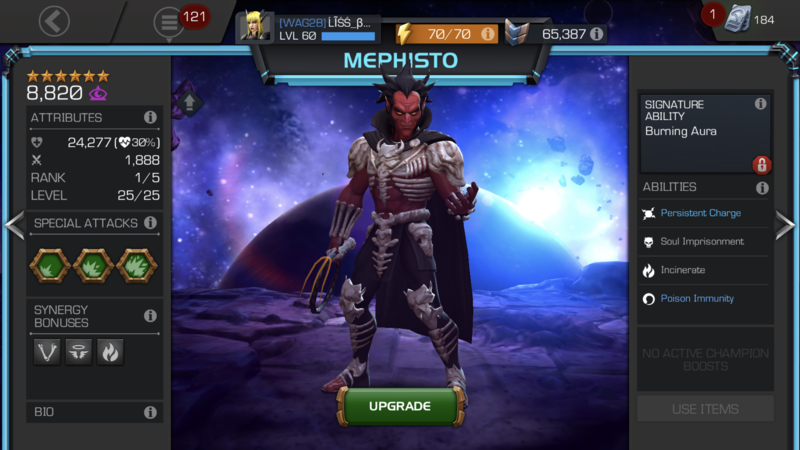 But after playing around with this champ and testing a few synergy teams I have come to like my newly acquired 6* Mephisto. I have him teamed with The Champion and MS for some nice soul charges and damage. Heading into a 2nd right I have 6 charges already built up. And if I mess up I get healed back to 100% and still head into the next fight with 2 soul charges. So while I didn’t get who I wanted and I got someone I was overlooking, I do have to say I am not upset at the first champ I pulled in 2019. Def not a champ to complain about. 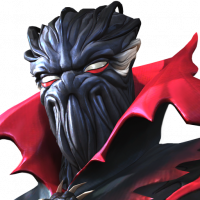 His adrenaline and regen makes him a great champ for questing. Not complaining, he was just one I was overlooking because I always thought of him as a Defensive champ. But I quite like him after playing with him for a while now. Although Pun99 does have a few uses. His soul imprisonment is one of his best qualities in my opinion. Add morningstar synergy. i used him to finish The Champion uncollected fights if i KO'd my main champ. Mephisto kept him locked down from regen and unstoppable for a long time using sp1's to refresh. Doesn't need dupe to be great attacker either. Best "kind" of 6* you can get at this point. I think a lot of people see him that way: he was seen that way in discussions for quite a while. But I think he's a very underrated attacker. At my alliance tier he's an extremely effective path 7 attacker in particular, and also a very interesting questing choice against certain content. And definitely a good 6* pull because he doesn't need to be awakened to be immediately useful. Agreed @The_Boss9 . His damage output leaves something to be desired. But overall, he is pretty grand. I love my 4* R5. Hoping to pull a 5 or 6* Mephisto. 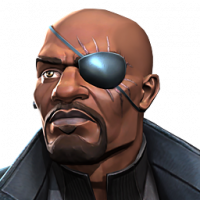 He used to be a mainstay on my AW attack team with Blade and a rotating 3rd depending upon what I saw on my path. Recently replaced by 6* Nebula (dual immunity, regen, and WAY better damage output) and/or 5* R4 Ghost. I would gladly use him again if I get a 5* or 6* down the road.